How to get to Setubal? The district of Setubal is located around 35km south east from the capital of Portugal (Lisbon) and around 220km from the Algarve. 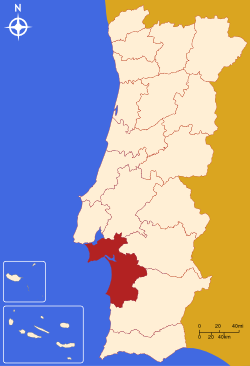 The city of Setubal is the capital of the district that consists of several locations: Palmela, Azeitão, Sesimbra, Álcacer do Sal, Sines, Montijo, Palmela, Grândola, amongst others, each of them with specific characteristics. If you're taking a flight to Portugal, the best way to reach Setubal is flying to Lisbon airport. From there you can take a taxi, a coach, rent a car or even take the train. Depending on your transportation, the journey will take around half an hour to Setubal. Another alternative is taking a flight to Faro airport in the Algarve and then go up north until you reach Setubal. This journey will take you around 2 hours on the motorway but if you have the time, you can travel along the "Costa Vicentina" from the Algarve to Setubal, which is a wonderful and relaxing trip along white sandy beaches and typical Portuguese villages, reaching Setubal just in time for dinner. In this map you can see the Setubal district with its several locations. On the left side just below Sesimbra is the Setubal bay that meets here with the Atlantic ocean. 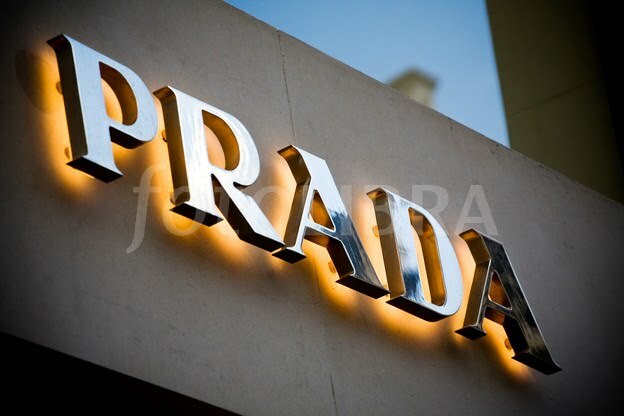 The luxury fashion house Prada is launching by the end of March a limited edition summer collection of sunglasses that represents 6 cities across the world that are a holiday resort and on Prada’s city trip list. 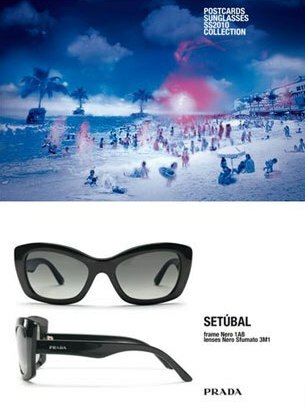 And one of the destinies is Setubal. Part of the collection "Postcards Sunglasses" with 6 six different sunglasses, the Setubal ones are totally in mat black with a retro design and tinted lenses in vogue this season. 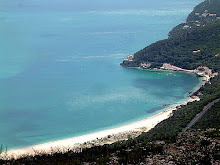 "Setubal has one of the most beautiful bays in the world. 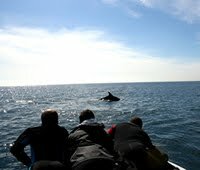 And recently they found more then 200 sea species at Arrabida. Setubal is bright yellow facades and balconies jutting out, welcoming. The famous old Mosteiro de Jesus topped with lace patterned stone and the great, colored ships in the port look, from a distance, like bobbing toys. Water the color of a cloudy bottle. A faded postcard is my sacred relic. 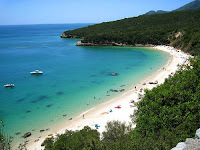 The bay of Setubal was voted a member of the Most Beautiful Bays in the World Club. This cut out estuary is leaned with the buttresses of Serra da Arrábida and separates the Atlantic Ocean by the peninsula of Troia. 23000 ha are classified as natural reserve. As the most important natural habitat for the conservation of the bottle-nosed dolphin, fulfilling one of the nature requirements demanded by UNESCO, The Bay of Setubal will benefit from added values, notably from the international projection of the city. Its main aims are to link the city to the river and valorize the environment. In particular the Sado Estuary Nature Reserve and the Arrábida Natural Park, which has unique characteristics and contains species that can only be found in areas near the Mediterranean. There are also excellent beaches, especially Figueirinha, Galapos and Portinho da Arrábida (a magnificent sheltered bay), And on the other side of the River Sado, within easy reach by ferry, there is the Tróia peninsula with about 18 kms of beaches and a golf course. Portugal Dream Coast tribute to one of us! Tribute to Jose Mourinho, that has Setubal as his homeland. Festroia is an international cinema festival that takes place every year in Setubal at Forum Luisa Todi, since 1985. This year it will take place on the 4-13 June. The festival's competitive section is open to films from countries producing less than 30 features per year. The festival produces an award ceremony every year in the first week of June. The main award is the Golfinho de Ouro (Gold Dolphin). This year the festival will also place a tribute to Slovak cinema, revealing that, although the Czech Republic and Slovakia are separate countries since 1993, the spirit of Czechoslovakia, that united them for decades, is still alive in art. This festival usually brings together many well-known personalities like Pedro Almodovar, Robert Mitchum, Kirk Douglas, Christopher Walken, Mickey Rooney, Dennis Hopper, Lauren Bacall, Francesco Rosi, amongst others. Festroia is also part of FIAPF (International Federation of Film Producers Associations) that also included the Cannes festival. It is a great op portunity to visit Setubal, watch some good films, meet new people and even spot some celebrities! Long time ago there was a club in Setubal called "Seagull". It was more than a club, actually. It became a reference for a huge generation of people from all Portugal and beyond, just because it was considered the best club in the country. Some press reporters even wrote at the time“ God created the World and Alfredo (owner) created Seagull". People would travel miles and miles just to be able to have a nice dinner in Setubal and then hit the dancefloor at Seagull on a Saturday night. Seagull was located on the way to the famous Galapos beach, it had giant screens with videoclips all night long and an open air balcony over the sea and below the stars on a completely idylic scenario. A place to dance, make friends, fall in love, unwind and completely let your hair down. 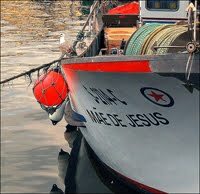 Something really special is about to happen in Setubal. On the 14-16 May it will take place in the region the "Seagull Again" weekend, full of activities and events and with the mega party "Seagull Again" taking place at the Tróia Design Hotel. Did you know that Roxette's music video "Anyone" was recorded in Troia? One of the most amazingly beautiful beaches of the Setubal region is the Galapos beach in Arrabida. Relaxing on the white sand means that you have the bright blue sea ahead of you and behind the stunning Arrabida mountain, sheltered from strong winds by its delightful cliffs. Very often known as the "caribbean" of Portugal, this beach is a quiet place to relax and enjoy your holidays. The sea is very quiet which makes it a fantastic place for scuba diving and snorkeling due to its stunning underwater scenery. Join our Facebook group and see more photos of Galapos beach. 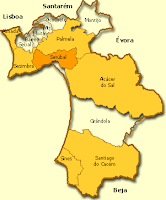 Who knows the Setubal region?
. 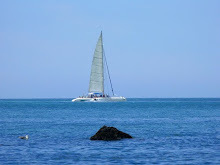 People that love relaxing or having romantic holidays know that the Setubal region is not crowded as the Algarve and they can actually walk along the white sandy beaches at their own pace.
. Golf players know Troia in Setubal because is has one of the top and most challenging Golf courses in Europe as well as the most beautiful sea views from a Golf course in the country.
. Dolphin lovers know the Setubal bay because is the only place in Portugal where you can watch dolphins in the wild. And they can even call them by their names!
. Scuba divers know the Setubal bay is great because they regularly vote it as one of the top diving spots of Europe.
. Cuisine and wine lovers know Setubal because it has one of the tastiest cheeses in the country, the best fish dishes and the well-known Moscatel wine, as well as several desserts and cakes that make them always wanting to come back for more.
. People that love nature know Setubal because of the stunning Arrabida range (which soon will be considered world heritage) where you can have the desired relaxing contact with nature, playing sports, walking or just meditating.
. People that love Sailing love Setubal, not only for its wonderful conditions to practise this sport, but also because its one of the locations where the World Sailing Match takes place.
. People that love photography know that Setubal offers the most stunning landscapes in Portugal.
. People that love beautiful Resorts and Inns know that the Setubal region has the most exclusive and romantic ones.
. People that like to know about a country's culture love Setubal because of the many cultural events happening and also the many historic locations they can visit like the Roman ruins in Troia. What are your reasons to know Setubal? If we can make you feel even a small part of what you could feel here, this Blog has served its purpose. Our time here, we hope, will make it easy for you to travel to Setubal or even choose it for your next Portuguese vacations. We're always adding to the Blog so keep looking back to for more information about this beautiful spot.